From Michael Pollan to locavores, Whole Foods to farmers’ markets, today cooks and foodies alike are paying more attention than ever before to the history of the food they bring into their kitchens—and especially to vegetables. Whether it’s an heirloom tomato, curled cabbage, or succulent squash, from a farmers’ market or a backyard plot, the humble vegetable offers more than just nutrition—it also represents a link with long tradition of farming and gardening, nurturing and breeding. In this charming new book, those veggies finally get their due. 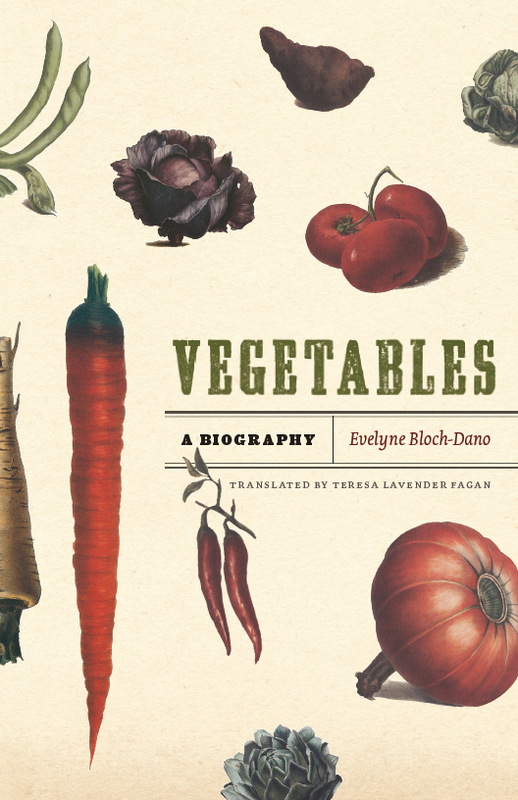 In capsule biographies of eleven different vegetables—artichokes, beans, chard, cabbage, cardoons, carrots, chili peppers, Jerusalem artichokes, peas, pumpkins, and tomatoes—Evelyne Bloch-Dano explores the world of vegetables in all its facets, from science and agriculture to history, culture, and, of course, cooking. From the importance of peppers in early international trade to the most recent findings in genetics, from the cultural cachet of cabbage to Proust’s devotion to beef-and-carrot stew, to the surprising array of vegetables that preceded the pumpkin as the avatar of All Hallow’s Eve, Bloch-Dano takes readers on a dazzling tour of the fascinating stories behind our daily repasts. "Bloch-Dano displays here erudite command of culinary history with both literary and historical anecdotes. . . . Digesting the contents of this little book yields a trove of trivia with which to impress shoppers and vendors alike at the farmers’ market." "This allusive, impressionistic, quintessentially French tour of the kitchen garden takes us from aphrodisiac artichokes to Zola’s gritty market stalls, with many a literary and gustatory detour. Lazy summers in grandmother’s garden, the frenzy for fresh winter peas that gripped the court at Versailles in 1660, the global travels of the chili pepper, the contested history of Cinderella’s pumpkin--it’s all here, and it’s all fun." "From Grandma’s vegetable garden to our childhood tables, from personal memories--yes, members of the pumpkin family are also Proustian madeleines--to the origins of vegetables and to the way they have been cooked throughout the ages and on different continents, from the healing cabbage to the aphrodisiacal artichoke, we feast upon so much new information and upon how we can benefit from it." "A book that Colette would have adored, one that gives vegetables back their original flavor, that restores the parsnip or the cardoon, leads us through the kitchen garden into a child-like thrill of literature, and celebrates the democracy of pleasure." "A lovely book that makes you feel at once hungry for these plants and satiated by the knowledge you just reaped about them." "Quirky . . . entertaining. . . . Bloch-Dano’s book confirms that we are what we eat, and that vegetables, like Bloch-Dano’s gardens, are firmly rooted in the realm of imagination."